A North Carolina man's love for his hunting dogs kept him outside as Hurricane Florence approached. It led to his death. KINSTON, N.C. (AP) — Hurricane Florence was blowing across eastern North Carolina hours before making landfall, and Bennie Lee Sutton’s hunting beagles were howling in their backyard kennel. So he was up in the middle of the night doing what he knew would quiet the pack of more than a dozen hounds: parking his pickup nearby and shining the headlights into their pen. Sutton could be heard talking to someone, probably the dogs, shortly before dawn Friday as winds swirled 70 miles north of where the hurricane was about to make landfall near Wilmington, said his daughter, Tameria. But hours later when she and her mother looked outside for the avid hunter, he was gone and some of his dogs were outside their pens, roaming their small neighborhood surrounded by croplands and open fields. Tameria searched again, this time looking behind the kennels in the yard Sutton and his wife, Marian, owned for nearly half a century. There he was, on his back in a grassy field on the other side of his property line. Doctors chalked up his death as one of the 27 in North Carolina blamed on the storm. 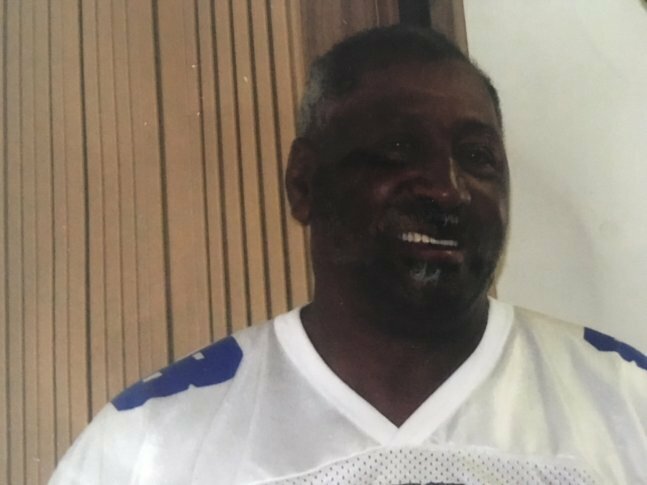 Bennie Lee Sutton was 77, a big man with a bad knee and a pacemaker who previously had double-bypass heart surgery, his family said. There were no wounds, so no autopsy was performed to establish the cause of his death, something Marian Sutton accepts as logical. He formerly worked on the production line at a local textile plant and then did tree removal, his wife said. The couple’s son died falling out of a tree that he and his father were cutting down in 2008, said Marian Sutton, 68. The couple first met after Bennie had already finished high school and he was a popular local athlete, she said. They became romantic years later, married in 1972 and moved into the 1,110-square-foot brick home built for them. “He was a people person. He would mingle with the drunkard just like somebody who’s sober,” Marian Sutton said. An avid outdoorsman with deer heads — along with the other end of one animal — mounted on the living room walls, Sutton was as likely to be outside in a storm as sitting safely indoors, his daughter said. Photos of his family, as well as former President Barack Obama’s, stand on a glass table and lean against the legs below it in the center of the room. Trophies and programs collected during Sutton’s athletic career in the 1970s and 1980s fill a glass cabinet. W.S. Nicholson Sr. knew Sutton since the early 1970s when he was admired on the softball diamond and basketball courts. Nicholson was working at a local tire plant and joined one of its softball teams, where he encountered Sutton as a block of a man at about 6-foot-2 and 240 pounds who commonly slammed opposing pitches over outfield fences. The tall black man was so good that all-white teams wanted him on their side despite the informal segregation of the day, helping to bring change to a small, rural Southern town, Nicholson said. “It was still the mindset of a lot of people that didn’t really want to mix,” Nicholson said. “But because of his talent and his character, his personality, they wanted, they needed” him. Confident, but controlled, Sutton never argued an umpire’s call on the diamond, said Nicholson, who became Sutton’s pastor at Savannah Free Will Baptist Church in Grifton. Taking on a task, Sutton would see it through, Nicholson said. The church would raise money by selling boxed lunches of grilled chicken, Nicholson said, so Sutton would start the charcoal at 2:30 a.m. to ensure customers could start picking up their meals eight hours later. Sutton also didn’t hide his emotions, joining in the praise during church services or keeping friends laughing. “He was just a big man, with a big heart, big emotion,” Nicholson said. It’s not clear if any of the friends in his hunting club will take the dogs, Marian Sutton said, but at her age she’s not able to care for such a large pack and plans to give them away.